- Sizes : L-75 x W-37.5 x H-77.5cm. - Packing : Wooden box. We are offering a superior quality designer Stone Fountains/ Marble Fountains to our most valued clients. These Stone Fire Place are made by using superior quality raw material which ensure its quality and durability. We are specialized in Indoor Fountains with rare varities of Natural Stones. Leveraging on our extensive market knowledge, we are providing a high-quality range of Glass Water Screen Indoor Fountain. A touch of the royal is how you can define our this exclusive offering of indoor fountain. These fountains are the best example of perfect craftsmanship. Further, these feature flawless finished beauty that elegance standards that add life to the indoors. We are one of the most important organizations of broad range of Indoor Fountains. Offered products are exceedingly demanded in the market for their wonderful finish and other listed features. Available in exclusive range of finish choices, these exclusively crafted Lotus Indoor Fountain choices are perfectly suited for areas like halls, patios as well as in outdoor spaces like gardens, terrace spaces and other open areas. Our natural stone is a decorative accessory, which is used enhancing the look of the home, home as well as exteriors. Designed with utmost precision, our natural stone fountains are impeccable in nature. 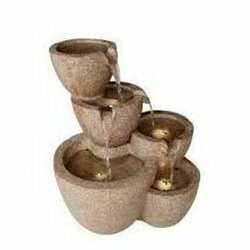 Natural stone fountains are available in various styles such as: Victorian or modern. In order to keep pace with the never ending demands of customers, we are involved into offering wide range of Designer Indoor Fountain. 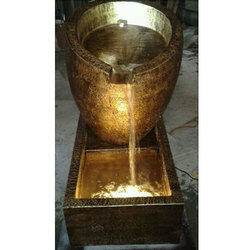 Indoor fountains are available in different sizes and shapes.